Dina Asher-Smith may have only been equal fastest in the women’s 200m semi-finals but she was a clear and delighted winner in the final as she won Britain’s first medal in Amsterdam. The 2013 European junior champion had a superb bend and entered the straight with a two-metre lead. Two years ago she pulled up injured in the final while fighting for a medal, but now older and stronger, she never looked like losing. Bulgaria’s Ivet Lalova-Collio, who was the 2012 100m champion, closed marginally as the 20-year-old Briton slowed slightly but it was still a convincing margin of victory. Her time into a slight headwind was a big season’s best of 22.37, improving on her 22.57 semi, with Lalova-Collio on 22.52, while Germany’s Gina Luckenkemper was third in 22.74 and Jodie Williams, with the handicap of the inside lane, sixth in 22.96. 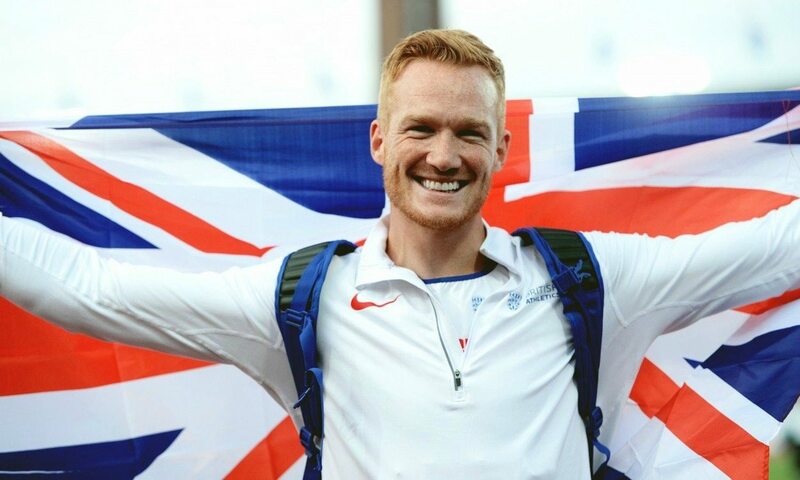 Already the Olympic, world, European and Commonwealth long jump champion, Greg Rutherford got off to the perfect start with an 8.12m opener into a strong headwind. None of his rivals had jumped as far legally this year. Even so, it didn’t hold the lead even through the first round as the 2.6m/sec wind Rutherford jumped into became an over the limit 2.1m/sec tailwind for Michel Torneus of Sweden who jumped 8.21m. Rutherford followed with a no jump in the second and third round and then a marginally better 8.13m in the fourth as Torneus stayed around eight metres. In the fifth round, the Briton showed why he is one of Britain’s greatest competitors of all time though as aided by a marginal 0.5m/sec tailwind he sailed out to 8.25m. Torneus’s response was two no jumps. Rutherford himself finished with a 8.12m to ensure he had four of the top five jumps and the best four legal jumps. The top two aside, the standard was poor and the home nation’s Ignisious Gaisah, who jumped just 7.93m, won the bronze medal on countback from Radewk Juska of the Czech Republic. Britain had hopes of a men’s 100m medal too but Richard Kilty exited with a marginal false start. On the second running it was a very exciting finish with just one hundredth of a second between the top three with the Dutch crowd delighted with the strong finish of former Dutch Antilles Churandy Martina. He shared the winning time of 10.07 with former Jamaican Jak Harvey, who won silver for Turkey. Close behind on 10.08 was favourite and joint European record-holder Jimmy Vicaut, who again failed to fulfil his potential. James Ellington of Great Britain also wasn’t at his best and finished a disappointing fifth in 10.19. In the 100m semi-finals, in perfect conditions (+1.5m/sec) Ellington had finished a close second in a PB 10.04 just behind Vicaut’s 10.03. Harvey was a clear winner of the second semi in 10.04 as European junior champion Ojie Edoburun was just outside his season’s best with a non qualifying 10.20. Kilty won the final semi in 10.15 into a headwind. Cindy Roleder improved from sixth in 2012 and third in 2014, to easily win the 100m hurdles gold for Germany in a European lead of 12.62. The 2012 champion Alina Talay fought hard but didn’t quite have the same finish and finished second in 12.68. Britain’s defending champion Tiffany Porter was close until halfway but had to eventually settle for a clear third in 12.76. Porter had won her semi-final in 12.97, which was curiously slower than two non qualifiers which included 2006 champion Susanna Kallur. Both Talay and Roleder, who both surprisingly won medals in the World Championships in Beijing last year, ran 12.76. The men’s javelin was a close and exciting contest but a modest standard until the fifth round. The 2013 world champion, Vitezslav Vesely of the Czech Republic, was leading with an 83.59m third round throw but that was completely overshadowed by the 86.66m throw by world junior record holder Zigismunds Sirmais. The Latvian had won the 2011 European junior title but had struggled to make his mark as a senior until this point but this was sufficient for the title. Vesely took silver and Antti Ruuskanen won the bronze with 82.44m. Thomas Rohler, who has thrown 91.28m this year, could only manage 80.78m and finished fifth. The women’s high jump was a hard-fought competition though as for much of this year, the standard was modest with only five jumping clear at 1.93m. By the time it went up to 1.96m, only three remained in the competition. Bulgarian Mirela Demireva and Lithuanian Airine Palsyte had perfect records up to this point and were sharing the lead as Ruth Beitia had failed one of her jumps at 1.93m. However, the defending champion regained control with a first time clearance at 1.98m, to ensure her third European gold medal at the age of 37. Beitia has won an incredible 27 Spanish high jump titles indoors and out and must be relieved she didn’t retire in 2012 as she had planned and changed her mind after two months out. The women’s shot never looked like it would be that close a contest anyway but the 2015 world champion Christina Schwanitz pretty much guaranteed victory with an opening 20.17m, which was a European lead by well over half a metre. She also beat her previous leading mark with 19.55m in the third round and was untroubled in defending her title. All four of her measured throws were way above the opposition. As expected, Anita Marton of Hungary was second best with 18.72m to match her world indoor silver medal. Emel Dereli, who won a world youth and European junior double gold in 2013, took bronze for Turkey with 18.22m. In her biggest event to date, Rachel Wallader struggled to get anywhere near her best form. She opened with a no throw and then threw 15.77m and 16.06m to finish 12th. In the decathlon hurdles, Oleksiy Kasyanov increased his overnight lead with a 13.93 championship best and then still held control in the discus with 42.46m. He cleared a respectable 4.80m in the pole vault but lost close on 200 points to Thomas van der Plaetsen who vaulted 5.40m. The Belgian then threw 57.23m to consolidate his lead as Kasyanov had a disastrous 48.23m to drop to fourth. A 4:37.84 1500m gave the Belgian the gold with 8218 points with Adam Helcelet second for the Czech Republic on 8157 just ahead of Serbia’s Mihail Dudas who scored 8153 points. Bryant needed an unrealistic 4:24 to achieve an Olympic qualifier of 8100. He achieved 4:33.88 and finished a fine fifth with 8040 points. The men’s 400m hurdles semi-finals were surprisingly good quality. In the first race Jack Green ran a season’s best and his second fastest ever time of 48.98. However, he was only third in a race won in a Norwegian record 48.84 by Karsten Warholm. While Green failed to qualify automatically, he still got through comfortably as a fastest loser. Rhys Williams made it through automatically in heat two with a powerful finishing drive in 49.22 behind Turkish import Yasmani Copello, who set a European lead of 48.42. Tom Burton struggled in the finishing straight and dropped to fourth in 49.71 and failed to advance. The 400m defending champion Martyn Rooney made a great advance in the form he had previously shown in 2016 in the semi finals. He won the second race in a season’s best and Olympic qualifying mark of 45.04 to qualify as the fastest for the final. Jarryd Dunn was fourth in the third semi-final in a season’s best 46.00 but was well short of qualifying for the final. In the women’s 400m semi finals, clear pre-race favourite France’s Floria Guei confirmed her superiority with a 51.01 victory. In second place, former Olympic and double world champion Christine Ohuruogu easily made the final with a big season’s best of 51.35 and will go into the race as third fastest and with a good chance of winning her first European individual medal. Anyika Onuora was a clear winner of the second semi-final with a time of 51.84. In the third semi-final, defending champion Libania Grenot took almost a second off her season’s best to set an European lead 50.43 and show she will challenge Guei. Jenny Meadows ran a typical gritty race in the first of the women’s 800m semi-finals, leading through 400m in 60.03 and 600m in 91.41, but she struggled in the last 120m and dropped to sixth in 2:03.13 in a race won by Joanna Jozwik in 2:01.52. The second heat was won easily by European leader Renelle Lamote of France who won in the overall fastest time 1:59.87. Alison Leonard unusually found herself in front on the final semi final on the last lap and she led well into the straight but just lost out on the vital second automatic spot by 0.10 of a second as she finished third in 2:01.31. the winner was Natilya Pryshchepa in 2:01.75. In the men’s 1500m heats all three Britons, who are renowned more for the strength than speed, had varying fortunes where a top three place was needed to guarantee a final spot. In heat one Tom Lancashire was short of finishing speed in the straight a modest paced event and finished sixth in 3:42.08. European indoor 3000m medallist Lee Emanuel lost his place on the last lap and though rallying in the straight, he initially came fourth in 3:42.92 with a 55-second final circuit. That meant he failed to qualify, however following the later disqualification of Jakub Holusa he moved up to third and gained a place in the final. Jake Wightman benefitted from a much quicker pace in the final semi (57.18 first lap) and this time speed wasn’t as crucial. Only fourth into the straight he found a strong kick to pass 2012 champion Henrik Ingebrigtsen. His last lap was 55 seconds and he won in the day’s fastest time of 3:39.32. In the morning’s men’s 800m heats, British champion Elliott Giles was involved in a slow tactical race and was badly boxed at one stage but a gap opened up and he won in 1:50.31, just ahead of defending champion Marcel Lewandowski of Poland. But Jamie Webb struggled badly in the last 100 metres and faded to last. Much to the crowd’s delight, Thijmen Kupers was fastest with an extravagant front-running 1:46.48 ahead of event favourite Amel Tuka. Zharnel Hughes’ Olympic bid is over as he competed in the men’s 200m qualifying. The world fifth-placer was troubled by his knee injury and was a disappointing seventh in his heat in 21.21. Solomon Bockarie of the home nation and Bruno Hortelano of Spain were joint fastest with 20.55. The men’s triple jump qualifying was beset by technical difficulties which delayed the event mid session by around a hour and meant athletes had to do additional warm-ups after the break. Julian Reid excelled with a season’s best 16.62m, before the break, which though just short of the automatic mark of 16.65m, qualified him in sixth place. The 2006 silver medallist Nathan Douglas fell just 12cm short of the 12th final place with 16.33m in 15th overall. Karol Hoffman headed qualifying with 16.93m. There were no British representatives in the women’s pole vault qualifying where a modest 4.35m (with no failures) sufficed for a final spot. Ekaterini Stefanidi was the only sole athlete to clear (or even) attempt 4.50m – her opening height which she did at the second attempt. The men’s discus qualifying was held away from the stadium in the Musuem Square and it was Spain’s Lois Martinez who threw furthest with 66.00m. The women’s javelin qualifying was also held there. Conditions weren’t entirely favourable with Barbora Spotakova easily the best thrower with 63.73m. In what she says will be her final European Championships, Goldie Sayers was well below her best form and her 53.56m placed her just 26th. In an otherwise modest women’s 100m qualifying round, Germany’s Rebekka Haase was easily the fastest with a time of 11.23.